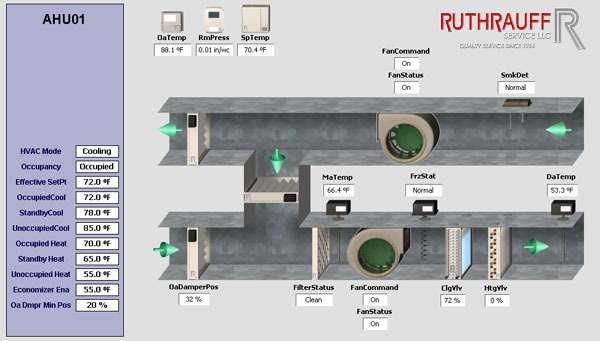 Ruthrauff Service LLC is the largest Independent control system provider in the Tri-State area. We offer complete system design, engineering, custom programming, installation, start-up, commissioning and service to most major manufacturers. We choose the manufacturer that is right for each customer. We install and service quality products that will meet your expectations including Honeywell, Johnson Controls, Carrier, Trane and Distech. All of these manufacturers enable us to provide open protocol systems. Today’s systems are WEB based graphical user interfaces with LonWorks and/or BACnet communications protocols. Due to our diverse background in the mechanical engineering and contracting business, our experience and knowledge is not limited to just control systems but rather the complete building environmental system. We have designed, programmed and installed some of the most complex systems in the area such as Medrad, Plextronics, Seagate Research Center, Westpointe Corporate Center, McKeesport Hospital, Sewickley Valley Hospital, Galleria Mall, Soldiers and Sailors Hall, Crown Castle and Stealth Technology.